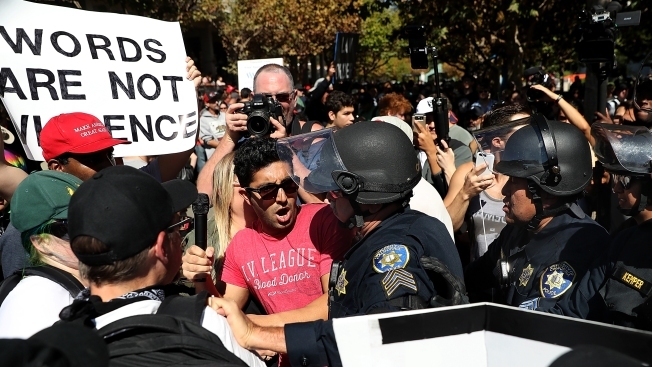 University of California police push through a group of protesters during a free speech rally with right wing commentator Milo Yiannopoulos at U.C. Berkeley on Sept. 24, 2017. Attorneys representing a group of conservative students at the University of California at Berkeley have filed a civil rights complaint with the U.S. Department of Justice, claiming that university officials have violated their clients' First Amendment rights. According to the law offices of Melo and Sarsfield, UC Berkeley chancellor Carol Christ indicated by email that her office was launching a hate crime investigation after students associated with the Berkeley Patriot publication distributed posters pertaining to last week's "free speech" events on campus. In the email, which was sent to students and staff on Sept. 21, Christ called Berkeley Patriot's posters "hateful messaging" targeting specific student populations and staffers. "I condemn these cowardly acts in the strongest possible terms," Christ wrote. "Our police department is investigating whether they constitute hate crimes and we will all do all we can to support those affected." As a result of that statement, attorney Marguerite Melo said her clients canceled "Free Speech Week" because the students involved weren't willing to subject themselves to "a pre-textual criminal investigation." "The message implied in her statements was clear -- conservative students will be subjected to a criminal police investigation (and implicitly a possible prosecution) for exercising their First Amendment Rights," Melo said in the complaint, which is dated Tuesday. This complaint is a follow-up on an earlier one filed against university officials on Sept. 19. The attorneys say that Christ's email, dated Sept. 21, and any subsequent hate-crime investigations that were opened up against their clients may have been a retaliatory response to that initial complaint. University spokesman Dan Mogulof said in an email Thursday that Christ never called for an investigation into a crime, but rather announced that police were checking to see if a crime had been committed, and they later determined there had not. Christ also never suggested that Berkeley students were responsible for anything, according to Mogulof. "These utterly unfounded allegations aimed at the Chancellor would be silly if they weren't so sad," Mogulof said. He continued: "This is all part of an ongoing effort to blame others for an event that collapsed when it became evident that most, if not all of the speakers never had any intention of coming. The letter to the Justice Department reads like an assignment for a class in short-form fiction." Mogulof compared the complaint to a lawsuit dismissed just last week by U.S. District Judge Maxine Chesney in which the Berkeley College Republicans alleged that university officials had suppressed conservative speech back in April when an event with commentator Ann Coulter had to be canceled because the university could not guarantee it would be safe. The cancellation prompted extensive protests and counter-demonstrations. The U.S. Department of Justice did not immediately respond to requests for comment. The Law Offices of Melo and Sarsfield LLP, are located in Visalia. They specialize in civil and employment rights cases, according to the firm's website.